The war on pants continues! 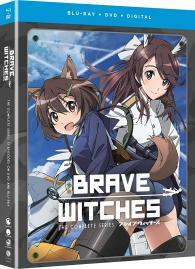 Meet the 502nd Joint Fighter Wing, aka Brave Witches—an elite group of fighters in the war against Neuroi, dangerous alien beings bent on destroying the world. In this high-ranking group, Hikari Karibuchi, a young girl from Fusou, works her way up the ranks to catch up to her elite soldier sister, Takami. But her magic isn’t quite up to standards, and she’ll have to work her hardest to show she’s worthy of this top-notch squad. She’ll soon learn that war is a dangerous game, and even magic comes with a cost.